Choker necklaces are so in this season! I ordered this gorgeous, delicate lace choker necklace* along with this bag! I love wearing it with dark outfits and it really looks unique and delicate! It costs $2.62/ Rs 150 approx! It is currently out of stock but you can find the similar ones HERE! This choker necklace set comes with a lace choker, layered with two more necklaces! The lace choker feels comfortable against my neck and does not choke it #lol! The second necklace is a bit larger and falls just below the lace choker. The longest necklace is with the heart pendant! It is super gorgeous and can be worn on its own! The heart pendant is studded with diamonds and looks very elegant when worn with a LBD or other evening dresses! I have worn this ckoker set a lot of times and have not seen any sign of wear and tear! - Looks elegant and delicate! - It's not like any other choker necklace in the market! - Zaful provides worldwide shipping! - As the color of the lace is light, it might get dirty if you touch the necklace again and again or if you sweat a lot! 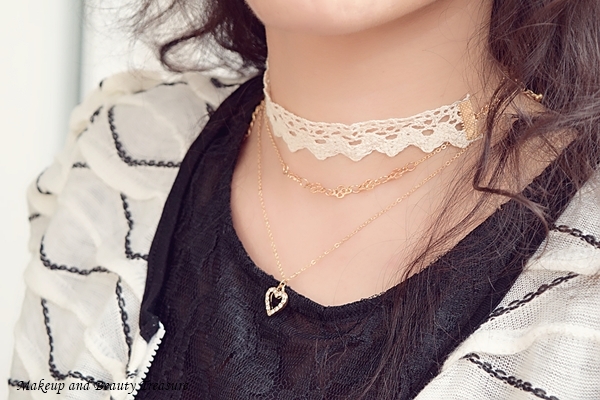 Zaful stocks really awesome choker necklaces. I loved this piece and already planning to order more. Their products are of really good quality and I would definitely recommend this website to everyone! Do you like choker necklace? How about the layered ones?